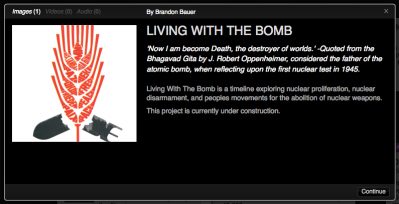 I have begun working on a new project titled “Living With The Bomb”. It is a project exploring nuclear proliferation, nuclear disarmament, and peoples movements for the abolition of nuclear weapons. I have began a few associated sites related to the exploration and development of the work. There is a wordpress site relating to research and development of the project that can be found here. I have also started a timeline relating to my research that can be found here. Both of these site are in progress and will act as a supplement to the larger project and to the work produced. The first iteration of the work is scheduled for exhibition at the Frank Juarez Gallery at the end of November.